C. Fundanius was one of the moneyers for the year 101 BC, as well as a Quaestor the same year - as indicated by the Q on his coins. The gens Fundania was a plebeian family at Rome, which first came into notice in the middle of the third century BC. Although one of its members obtained the consulship in BC 243, the Fundanii never attained much importance in the state. 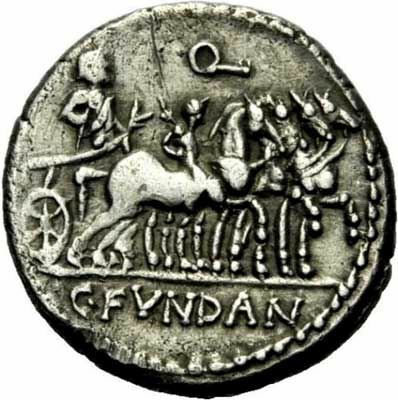 The Fundanii are known to have used the praenomina Quintus, Gaius, Marcus, and Lucius, all of which were amongst the most common names throughout Roman history.